Venezuela Foreign Affairs Minister Jorge Arreaza says the former Spanish colony considers Spain's ambassador Jesus Silva Fernandez persona non grata. Venezuela says it's expelling the ambassador from Spain, accusing the European country of meddling in its affairs. 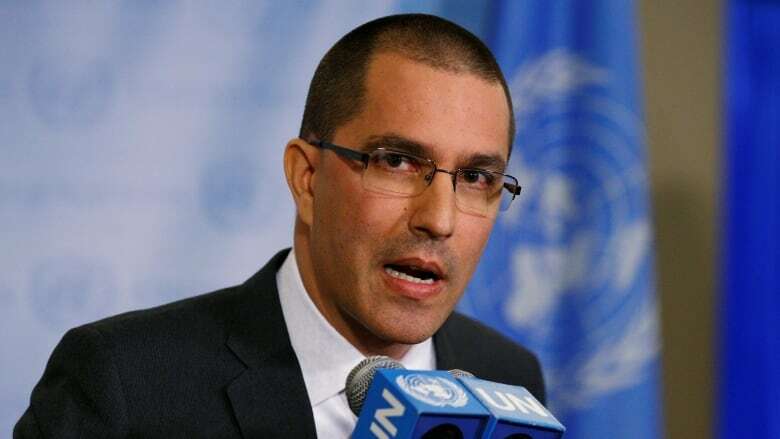 Foreign Affairs Minister Jorge Arreaza said in a statement Thursday that Venezuela considers Spanish ambassador Jesus Silva Fernandez persona non grata. Spain was a colonial power in Latin American and remains a major trading partner. Many Venezuelans have fled to Spain during the Venezuela's deepening crisis. It is also among the European Union nations that imposed economic and travel sanctions on seven senior Venezuelan officials this week. Venezuela is in a deepening political and economic crisis under socialist President Nicolas Maduro, who has drawn criticism by the international community, including the United States. The assembly, stacked with loyalists, on Tuesday approved holding the presidential election by the end of April — months ahead of the traditional voting time. Maduro, who announced his intention to seek another term as leader, raged at Spain's conservative prime minister this week. "Mariano Rajoy, get on all fours, my friend, because the people are going to slap you," he told a rally of red-shirted supporters in Caracas. Venezuela last month expelled top diplomats Craig Kowalik from Canada and Ruy Pereira of Brazil.